Where Do Palliative Care Nurses Work? What Is a Palliative Care Nurse? 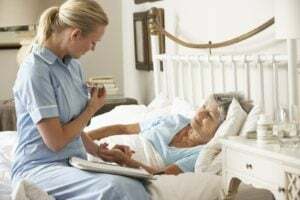 The palliative care or hospice nurse provides compassionate care, typically for the terminally ill and those who have little hope of meaningful recovery. This type of nurse has a special interest in creating an environment of pain relief and comfort, and works to promote these aspects of care through the cooperation of friends and/or family. The goals of care in these situations then become relieving suffering through a thorough assessment of the needs of the patient and family on a psychosocial, physical, and spiritual level. This nurse coordinates with other providers to meet the needs of the family and patient. Once death has occurred, the palliative care nurse offers bereavement support and assists in helping the family make final decisions. They also work to prepare patients and families for a peaceful and comfortable end of life transition. Nurses with a wide variety of care backgrounds can become palliative care nurses. Those who have experience with geriatric care and certain terminal diseases like late-stage cancer and heart disease are good candidates for this specialty. Strong communication skills are also needed, as palliative care nurses often coordinate with the patient's family. Lastly, empathy and compassion are needed to be successful as a palliative care nurse, as emotions can run high when death is involved. What Are the Education Requirements for Palliative Care Nurses? The palliative care nurse is not always required to have a Bachelor's degree (an ADN works as well), but is required to pass the NCLEX-RN exam and have an RN license in good standing. An LVN/LPN is also acceptable in some settings. Nurses interested in this specialty can also opt to take specialized palliative care courses, which are offered at many schools. Palliative care nursing can be provided in a variety of settings, wherever a patient in need resides. This includes hospitals, nursing homes, assisted living facilities, and private homes. Settings where the elderly convene or where chronic conditions are treated (like critical care units) are some of the most common places where palliative care nurses work. Many end-of-life patients prefer to have in-home palliative care if possible. Palliative care nurses must often strike the balance of alleviating the symptoms and pain of their patient without over-sedating them. Their main concern is to make the patient as comfortable as possible. They also provide important emotional support to the patient and their family, and often educate those involved regarding new ways to manage symptoms. What Are the Roles and Duties of a Palliative Care Nurse? The palliative care nurse earns an average salary of $61,400 with a range of $48,686 - $81,468. Location, certifications, education, and experience affect the salary of this position. The palliative care industry is booming due to the aging population. The employment outlook for a palliative care nurse is very good, and is projected to rise by 19% by the year 2022. Due to the demand for this type of nurse in a variety of care settings, palliative care nurses should find it reasonably easy to find a job in the field.